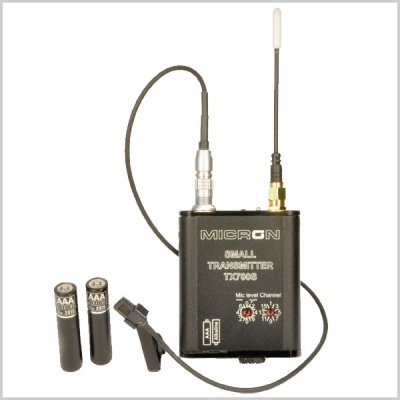 MICRON wireless microphone and communication systems have been setting industry standards in broadcast and location recording for some four decades. 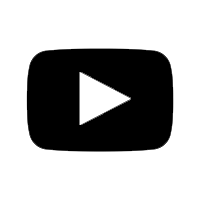 The company's design focus is on applying sophisticated electronic engineering to achieve the optimum balance of performance and cost. The MICRON TX700S combines the legendary Micron qualities of sonic integrity, long-term reliability and rock-solid construction in a new small package. It has been made as slim as is possible powered by AAA cells. It’s small size and weight will be most appreciated in dance and costume drama. The Small TX's sophisticated design acknowledges our over-crowded spectrum, and the non-harmonised radio microphone allocations of several territories. The TX700S has a broad switching bandwidth of up to 32MHz which can be supplied anywhere between 450 and 863MHz. From within the chosen 32MHz, using a Web app., the user can program 16 frequencies to be selected by the simple rotary Channel switch, providing effortless frequency agility in use. The TX700S transmitter is designed to provide the highest possible quality of transmitted signal. This approach achieves the utmost flexibility in operation for crews, operators and recordists, whether working internationally or simply under circumstances prone to interference, and offers the freedom and convenience of being able to use the systems across the world. Preserving audio signal integrity is also a priority. 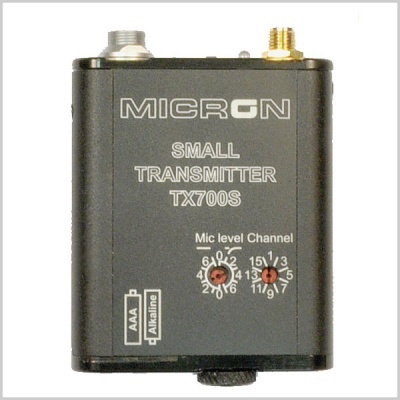 The Micron TX700S transmitter offers easy adjustment of the audio input level and bass cut via a single secure control, with a peak-reading LED level indicator. Designed to handle very high input levels, with generous headroom, it includes a fast-response limiter with a soft curve that is set up specifically to avoid clipping the signal on peaks. Also it can also act as an automatic gain control, but free of the pumping effects usually associated with this type of circuit. This sophisticated limiter enables operation with lower budget camcorders or mixers. Dedicated audio input cables are available to connect mic or line level signals to the transmitter, and to accept dynamic or electret microphone types. Equipped with a battery-status LED indicator, the transmitter may be powered by a pair of standard alkaline AAA batteries for up to 5 hours, or twice that using lithium AAAs. A near field control unit is available as an optional extra, to switch the TX between standby and ON, without the necessity to disturb its position on the artist for breaks in production. The unique battery compartment enables quick and simple battery replacement. The battery compartment's design, together with the Small TX’s overall strength and durability, is focused on withstanding the heavy demands of location use. Suitable for electret or dynamic mic.